Starting tomorrow and continuing for a week, players that deposit at Intertops Poker and Juicy Stakes Casino will get free spins on some of the casinos’ most popular slot games from Betsoft. 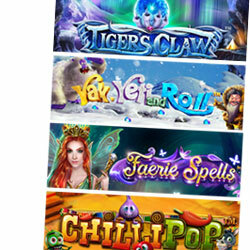 March 1 – 7, depositing players will get free spins on player favorites like the mystical Tiger’s Claw and the enchanting Faerie Spells. In Tiger’s Claw, players are guided through a mystical fantasy world in a quest for gems and artefacts. When a white Tiger’s Claw grasping a glowing orb appears on all five reels, eight free spins are awarded. Any toadstool can hide a hoard of treasure in the magical new Faerie Spells slot game. The Faerie Queen can reveal win multipliers or trigger the game’s unique four-tiered jackpot game.